A recent survey of maker educators conducted by Maker Ed found that a majority of educators liked the generosity, openness, and friendliness of the maker educator community. However, a lack of time and resources are key hurdles to engaging in face-to-face activities. Additionally, some survey responses also indicated that the wider community of maker educators is hard to find, and that this is keeping them from feeling connected to a wider community. One way to build a community of maker educators is to provide a designated space and time for people to meet and discuss their ideas around making. We at Maker Ed have had a great deal of success hosting our own events for maker educators, such as the Maker Educator Convening, Ed Stage talks at Maker Faires around the country, and local monthly meetups in the Bay Area. 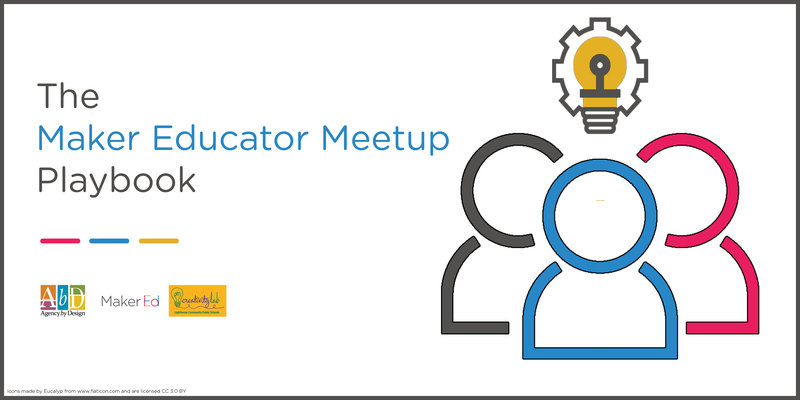 We are also hoping to help you start your own local maker educator meetup, and have put together a few resources to help you get started. The Maker Educator Meetup Playbook, created in partnership with Elizabeth Espinoza, Aaron Vanderwerff, Brooke Toczylowski, Ilya Pratt, and Angi Chau, aims to collect best practices and advice for starting a maker educator meetup in your own community. In addition to the Maker Educator Meetup Playbook, as part of Maker Ed and Digital Promise’s Maker Promise initiative, we are excited to be able to offer $200 stipends to educators interested in developing or expanding maker educator meetups in their communities, to help support the costs of meetups. If you are interested, please complete this short survey and we’ll get back to you within 14 business days.